It’s taken me two years to finally sit down and write a review of this book. That’s far too long. It’s too good of a book to have waited that long. I think I was so moved by it and enjoyed it so much, that writing about it was difficult for me. As it happens, author John Manos is a family friend whom I’ve know for essentially my entire life; at least, I’ve known him for as long as I can remember. He used to teach me chords to Buddy Holly songs on his electric guitar in the Evanston home he shares with his wife Leah. Seeing an electric guitar was an amazing novelty to me back then, let alone having the chance to actually hold and play one. Many, many years later, John and I would have the opportunity to perform with our respective bands on the same stage, on the same bill. That was a pretty big deal for me. I suspect it might’ve been pretty cool for him, too. John and my father worked together for decades, and for more than just a single company. It’s safe to say that watching the interaction between the two of them over the years has had a major influence on who I am today. Their combined sense of humor always made my younger self wish I was old enough to work with them. They always seemed to make work fun for themselves, and their employees. As fate would have it, I eventually did have this opportunity for a brief period shortly before graduating college. I worked as an intern at the financial magazine for which John was editor-in-chief. Meanwhile, my father was editor-in-chief of its sister publication, and worked out of the same offices. I don’t think I appreciated it at the time, but it was a pretty great period in my life. As a kid I would revel in watching my dad and John play on company softball teams together and have a blast at company picnics, and now here I was, playing right along side them. With all of that said, I like to think that it’s not a coincidence that the main character of this book is named Michael. (You know, ’cause that’s my name.) But I’m not here to speculate. The story opens in the mid-1970’s when Michael is a relatively average 19-year-old college student. Like many college students regardless of the decade, Michael dabbled in marijuana. But unlike most of us, his experimentation experiences lead to him being arrested for assisting in the sale of the drug. Basically he unknowingly directed an undercover cop to the dorm room of a student who was selling. Michael has a childhood friend who’s father happens to be a very important member of a Chicago mafia family. He’s powerful enough to have easily saw to it that Michael never see any time in jail. But Michael’s father is a proud man and refuses to let his son be associated with a known crime boss. Between this pride and the low-income situation Michael and his family find themselves, Michael ends up taking a deal that ultimately does send him to jail. Of course this, mixed with the violent events that Michael faces while locked up, proceed to alter the course of Michael’s life. Eventually, we move forward in Michael’s timeline and meet him again as he works as a mild-mannered professional living in Chicago. Of course, his past catches up with him as a bizarre series of events unfold, introducing a mystery which falls into the lap of a Chicago police detective who, naturally, has his own demons. The solving of the mystery almost takes a back seat to the amazing character studies and relationship development between several of the characters within the story, not the least of which involves the detective. Honestly, this book had the potential to become completely cliche. As I sit here describing it, I’m becoming even more aware of how easy it would have been to fall into that writer’s trap. Obviously, having been close with the author for more than three-and-a-half decades, I wanted this to be a masterpiece. But my fear was that it would be trite, trivial, and poorly executed. Of course, again from having known John for so long, I should have known better than to worry. John has always been a character in his own right, and it wouldn’t be in his nature to publish something less than masterful. Is this novel a masterpiece? I don’t know if I can say that, but it is literally one of the only books I’ve ever read that made me openly cry. There’s a very moving scene between Michael and the mafia boss that was so well crafted and so delicately written, that before I knew what was happening I had tears rolling down my cheeks. I’ve read a lot of great, moving books over the years. There was a time that I devoured books with such voracity I would plow through two or three of ’em a week. During that time, I was certainly moved to laughter, and to sadness, but I don’t recall ever having been moved to tears. 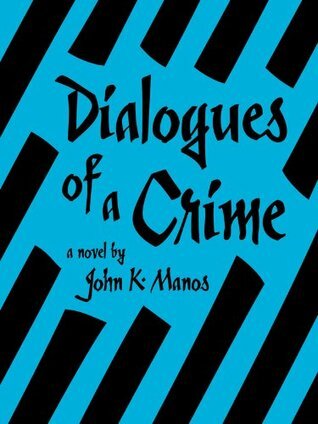 Dialogues of a Crime moved me to tears. It might have been a combination of the joy I felt as I became more and more engrossed in this work of art that my friend had created mixed with a little bit of it being emotionally the “right time, right place” for that particular scene to move me. But regardless, there’s something to be said for any writer and his ability to garner a physical response like that. It’s an impressive feat. Best of all is that the story’s conclusion is immensely gratifying. It’s a strange combination of what you almost want/expect, mixed with a touch of “what the hell…?” But John creates the finale with such grace and finesse, it works perfectly. It’s a Hollywood ending with Chicago flavor. Part of what makes it work so well is the culmination of the character’s cultivation within their respective relationships. Given some of the unspeakable scenarios that occur (which I’ve intentionally left out of this review) the need for a sense of closure with each of the main players is a necessity. But more importantly, it’s almost as if it gives the reader a chance to sort of decompress with the characters themselves. If written any differently, I fear we’d all put the book down left with little more than a case of the Bends. This is so much more than just a great story, or an enthralling mystery. It’s an investigation into the human psyche as much as it is a look into the penal system, or the world of organized crime. It almost takes reader involvement to a new level of interaction. As I read the book, I found times where I actually put it down in order to ponder philosophical questions which were raised by the story. Seriously, what more could a person want out of a book? I actually don’t know if my friend John has any other manuscripts in the works, I hope he does. And frankly, knowing him, I’m certain he does. I know I’m eager to read what’s next. In the meantime, I’ll have to reread this one again.